Lingon X 6.2.1 – Run applications and scripts automatically. Lingon X 5 is based on the great Lingon 3 and extends it with new features like running jobs as root and at multiple dates. It is now even easier to use yet much more powerful. Version X 5 is a paid upgrade. 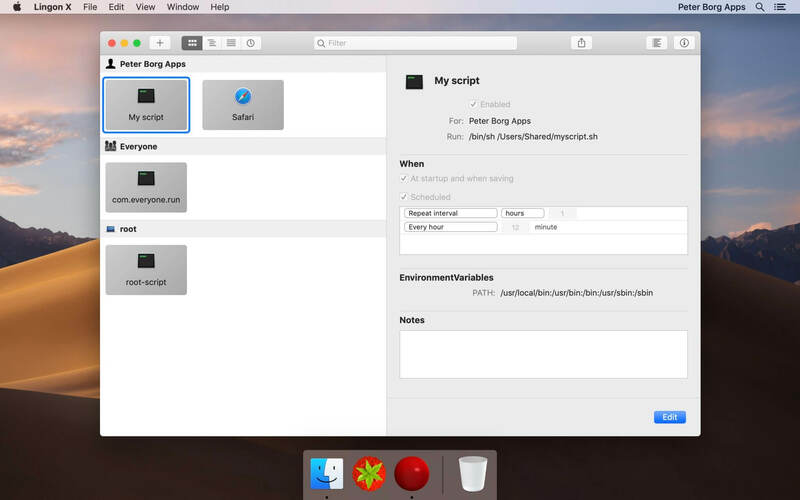 Start an app, a script or run a command automatically whenever you want it to. You can schedule it to run at a specific times, regularly or when something special happens. It can also make sure that an app or a script automatically restarts if it crashes. Lingon X can do all this for you and much more. Lets you run things automatically by modifying configuration files for the built-in system function called launchd so the system handles running the jobs so you don’t need to have Lingon open after you have saved your job. Released outside Mac App Store to be able to include requested features. Next story Navicat Premium 12.1.4 – Combines all Navicat versions in an ultimate version. Previous story Winclone Pro 7.2.1 – Clone your Boot Camp partition. Cocktail 7.2.1 – General maintenance and optimization utility. TechTool Pro 9.5.1 – Hard drive and system repair-and-maintenance tool.